SEOUL/WASHINGTON, Nov 29 (Reuters) - North Korea said it had successfully tested a powerful new intercontinental ballistic missile (ICBM) that put all of the U.S. mainland within range, declaring it had achieved its long-held goal of becoming a nuclear power. Wednesday's missile test, North Korea's first since mid-September, came a week after U.S. President Donald Trump put North Korea back on a U.S. list of countries it says support terrorism, allowing it to impose more sanctions. North Korea said the new powerful missile reached an altitude of around 4,475 km (2,780 miles) - more than 10 times the height of the international space station - and flew 950 km (600 miles) during its 53 minute flight. "After watching the successful launch of the new type ICBM Hwasong-15, Kim Jong Un declared with pride that now we have finally realized the great historic cause of completing the state nuclear force, the cause of building a rocket power," according to a statement read by a television presenter. In the statement, North Korea described itself as a "responsible nuclear power", saying its strategic weapons were developed to defend itself from "the U.S. imperialists' nuclear blackmail policy and nuclear threat". U.S., Japanese and South Korean officials all agreed the missile, which landed within Japan's exclusive economic zone, was likely an ICBM. It did not pose a threat to the United States, its territories or allies, the Pentagon said. "It went higher frankly than any previous shot they've taken, a research and development effort on their part to continue building ballistic missiles that can threaten everywhere in the world, basically," U.S. Defense Secretary Jim Mattis told reporters at the White House. "It is a situation that we will handle," Trump told reporters. Moon told Trump that North Korea's missile technology seemed to have improved, a spokesman for the South Korean leader's office said. The new Hwasong-15, named after the planet Mars, was a more advanced version of the Hwasong-14 ICBM tested twice in July, North Korea said. It was designed to carry a "super-large heavy warhead" and had much greater advantages in its tactical and technological specifications than its predecessor. 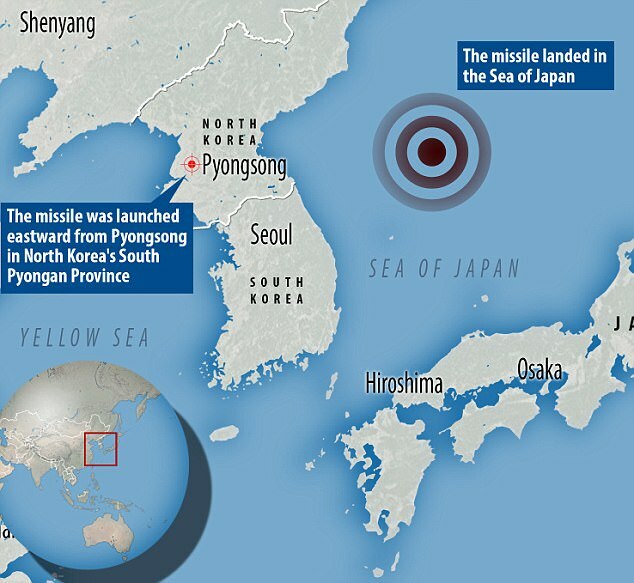 Based on its trajectory and distance, the missile would have a range of more than 13,000 km (8,100 miles) - more than enough to reach Washington D.C., the U.S.-based Union of Concerned Scientists said. U.S. stocks briefly pared gains on the news but the S&P 500 index closed up almost 1 percent and Asian markets largely shrugged off the news. A U.S. government source said the U.S. assessment was the launch was the latest in a serious series of tests to develop and perfect North Korea missile systems rather than any response to Trump.